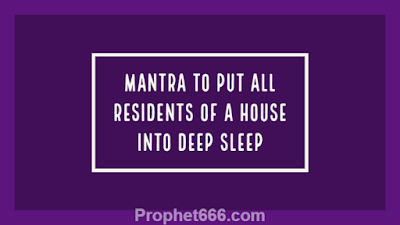 The text has not described the procedure of gaining Siddhi over this Mantra for simultaneously putting all the residents of a household into deep sleep. In my opinion, there has to be specific procedure of gaining Mastery over this Mantra or the power has been handed over to advanced Sadhaks through the Guru-Sishya Parampara. 1] The practitioner has to procure some Sarson Ke Beej or Mustard Seeds and hold them in his right hand and chant the Sleep Inducing Mantra given below just once. The Mustard Seeds have to be those which have not fallen on the ground and have been picked or removed from the Mustard Plant and stored. 2] Then, the Mantra Infused Mustard Seeds have to be sprinkled directly in front of the main door of the house. This simple Tantra is said to make all the residents go into deep sleep. Note- This Mantra does not appear to be dedicated to any deity or paranormal entity, like an Yakshini or Apsara. If any of our readers has more information about this Mantra, then, they should kindly share it for the benefit of other readers of this site. mantra is not marketing it's very dangerous don't do marketing.